Texas state Sen. Wendy Davis filibustered for 11 hours against sweeping restrictions on abortion back in June, becoming a hero for abortion rights activists. "It really has been a wave of abortion restrictions moving across the country and it has affected providers and women and their families," says Elizabeth Nash, who tracks the laws for the Guttmacher Institute. About a dozen clinics in Texas stopped providing abortions after a new law passed last summer. At least a dozen other clinics have closed across the country because of laws that say doctors must have admitting privileges at local hospitals, or because of another regulation requiring clinics to become mini surgical centers. So abortion rights activists say they're pushing a new legislative strategy. In New York, lawmakers introduced the Women's Equality Act in 2013, backed by Gov. Andrew Cuomo. "Why the state of New York?" asked Cuomo. "Because the state of New York has had a long and proud history of being the first one to stand up on issues like this, on issues of inequality." It includes pay equity for women and strengthens domestic violence laws. Andrea Miller, president of NARAL Pro-Choice New York, says it also codifies Roe vs. Wade, the decision that legalized abortion. "It says you have this right to make these decisions prior to the 24th week of pregnancy or thereafter if your life or health is at risk," Miller says. "It's quite simply, Roe vs. Wade put in state law to make sure that it's always there." The bill didn't pass this year, but it will come up again in 2014. Those who oppose abortion, including the New York State Catholic Conference, oppose the measure. Kathleen Gallagher, the conference's director of pro-life activities, says it's too broadly written. "In our review, it's an expansion of late-term abortions here in New York, which we don't believe New York needs," Gallagher says. Abortion rights activists dispute that, and say they'll work hard to get the package through. On the other side of the country, an abortion rights-friendly bill in California did pass. It expands the group of medical professionals that can provide abortions, allowing nurse practitioners, physician assistants and nurse midwives to perform first-trimester procedures. Dr. Joseph Speidel, a professor at the Bixby Center for Global Reproductive Health in San Francisco, says the law sets a precedent for other states. "The basis of the law change was a careful study that showed that the advance practice clinicians could do abortions as safely as physicians," Speidel says. Activists point to what they say is another success, the Pennsylvania Agenda for Women's Health, a package of bills spearheaded by the Women's Health Caucus in the legislature. A portion of the agenda was recently introduced by state Rep. Dan Frankel, a Democrat. "We want to change the conversation," Frankel says. "We want to talk about really, how do we enhance women's health?" Frankel says women who are poor have limited access to health care, including abortions. He says the agenda, including workplace accommodations for pregnant women and creating buffer zones around clinics where abortion protests take place, would help. "Those who are sincere in wanting to promote women's health in Pennsylvania ought to be able to endorse and help us pass this package of bills," he said. The Pennsylvania bills may face an uphill battle, as legislators there have passed stricter laws — especially since an illegal abortion clinic was discovered in Philadelphia. It's operator, Kermit Gosnell, was convicted of murder in the death of one woman and several viable infants who were born alive and then killed. Abortion rights activists call Gosnell an outlier, but those who oppose the procedures have used the case to lobby for more restrictions across the country, including in Texas, where Republican Gov. Rick Perry signed a new bill into law last summer. The Texas measure bans abortion at 20 weeks and requires nearby hospital admitting privileges for doctors performing abortions. 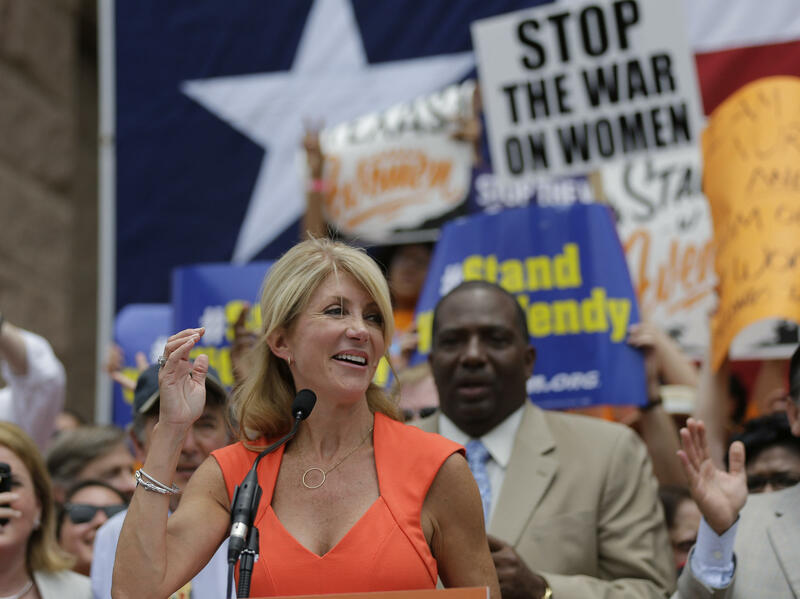 Abortion rights groups say they're mobilizing in opposition to the Texas law, and around state Sen. Wendy Davis, now a Democratic candidate for governor, who conducted an 11-hour filibuster on the issue. Activists say her decision to speak up inspired new supporters. "We've had a lot of increased interest in volunteering with our work," says Merritt Tierce, executive director of the Texas Equal Access Fund, a group that helps low-income women pay for abortions. "The most important thing that has come out of this is [a] conversation about abortion that needs to continue, that needs to intensify and that needs to stay focused on the complexities." Nash calls the effort a starting point. "What we have been missing has been a bill to rally around and to express the values of those who support reproductive health and rights," she says. And, now a look at an emerging legislative trend: In the past three years, Republican-led legislatures have backed 200 bills to regulate abortions and the doctors and clinics that perform them. Abortion rights have been on the defensive, but now they say they're working on a counterattack. NPR's Kathy Lohr has more. KATHY LOHR, BYLINE: Bills to ban abortions at 20-weeks are among the laws that cropped up three years ago and have now passed in about a dozen states. This year, North Dakota pushed to end abortions at around six-weeks of pregnancy. Elizabeth Nash with the Guttmacher Institute tracks the laws. ELIZABETH NASH: It really has been a wave of abortion restrictions moving across the country and it has affected providers and women and their families. LOHR: About a dozen clinics in Texas have stopped providing abortions after a new law passed last summer. At least a dozen other clinics have closed across the country because of laws that say doctors must have admitting privileges at local hospitals or because of another regulation requiring clinics to become mini surgical centers. So abortion rights activists say they're pushing a new nation-wide legislative strategy. In New York, lawmakers introduced the Women's Equality Act in 2013, and it was backed by Governor Andrew Cuomo. It includes pay equity for women and strengthens domestic violence laws. Andrea Miller with NARAL Pro-Choice New York says it also codifies Roe versus Wade, the decision that legalized abortion. ANDREA MILLER: You have a right - this right to make these decisions prior to the 24th week of pregnancy or thereafter if your life or health is at risk. It's quite simply Roe versus Wade put in state law to make sure that it's always there. LOHR: The bill didn't pass this year but it will come up again in 2014. Those who oppose abortion, including the New York State Catholic Conference, oppose the measure. Kathleen Gallagher with the group says it's too broadly written. KATHLEEN GALLAGHER: In our review, it's an expansion of late-term abortions here in New York, which we don't believe New York needs. LOHR: Abortion rights activists dispute that, and say they'll work hard to get the package through. On the other side of the country, an abortion bill in California did pass. It expands the group of medical professionals that can provide abortions and now allows nurse practitioners, physician assistants and nurse midwives to perform first trimester procedures. Dr. Joseph Speidel is a professor at the Bixby Center for Global Reproductive Health in San Francisco. DR. JOSEPH SPEIDEL: The basis of law change was a careful study that showed that the advance practiced clinicians could do abortions as safely as physicians. And this sets a precedent for other states across the United States. LOHR: Activists point to what they say is another success, the Pennsylvania Agenda for Women's Health. A portion of the agenda was recently introduced by Democratic Representative Dan Frankel, one of the sponsors. REPRESENTATIVE DAN FRANKEL: We want to change the conservation. We want to talk about, really, how do we enhance women's health? LOHR: Frankel says women who are poor have limited access to health care, including abortions. He says the new agenda, including workplace accommodations for pregnant women and creating buffer zones around clinics where abortion protests take place would help. FRANKEL: Those who are sincere in wanting to promote women's health in Pennsylvania ought to be able to endorse and help us pass these package of bills. LOHR: The Pennsylvania bills may face an uphill battle as legislators there have passed stricter laws, especially since an illegal abortion clinic was discovered in Philadelphia. Its operator, Kermit Gosnell, was convicted of murder in the death of one woman and several viable infants who were born alive and then killed. Abortion rights activists call Gosnell an outlier. But those who oppose the procedures have used the case to lobby for more restrictions across the country, including in Texas where GOP Governor Rick Perry signed a new bill into law last summer. GOVERNOR RICK PERRY: Today we celebrate and further cement the foundation on which the culture of life in Texas is built upon. LOHR: It's perhaps because the Texas law passed that abortion rights groups say they're mobilizing around it and around State Senator Wendy Davis who conducted an 11-hour filibuster on the issue. STATE SENATOR WENDY DAVIS: Members, I'm rising on the floor today to humbly give voice to thousands of Texans who have been ignored. LOHR: Davis is now a Democratic candidate for governor. Activists say her decision to speak up spurred action. MERRITT TIERCE: We've had a lot of increased interest in volunteering with our work. LOHR: Merritt Tierce is with the Texas Equal Access Fund, a group that helps low income women pay for abortions. TIERCE: The most important thing that has come out of this is conversation about abortion that needs to continue, that needs to intensify, and that needs to stay focused on the complexities. LOHR: And Elizabeth Nash with the Guttmacher Institute calls the effort a starting point. NASH: What we have been missing has been a bill to rally around and to express the values of those who support reproductive health and rights. LOHR: Abortion rights activists say they're tired of working just to defend abortion rights in the courts. So they say now they're taking a stand in the states.